A good, color photo is required to begin the process. The photo should be in focus and should be taken in daylight. Your dog should be looking at the camera. The photo should clearly show the color and personality of your dog. You can mail me the photo (it will be returned to you) or email me a JPEG or TIFF or PDF photo. Make sure you photos are labeled with your dog's name. 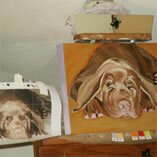 I will first sketch your dog in pencil on the canvas and mail or email you a digital photo of the sketch for approval. From there I will complete your painting in oil paints. I ask for a 25% deposit to begin your painting. This covers the initial sketch onto the canvas and is non-refundable. The remaining 75% plus shipping and tax (if applicable) is due upon completion and before delivery. I accept cashier's checks, money orders and PayPal. All rights reserved by the artist, Lisa O'Connell. The copyright for reproductions of these paintings remains with the artist. Any digital images of your finished painting are for your own personal use and reprints of your painting are are not to be sold for profit. This website is only for your personal use. You may not distribute, exchange, modify or sell anything you copy from this Site, including but not limited to any text or images, for any business, commercial or public purpose without permission.